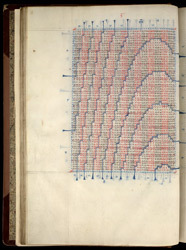 The Oxford almanac tables of John Chillingworth provided formulae for calculating the phases of the moon and movement of the sun. Tables such as the one on this side were used as aids in astrology but also in medicine because of the belief that the body and its humours were in tune with the movements stars and planets. Diagnosis and treatment of illness often included calculation of planetary and astral positions. For a king, the tables would be an instrument of power and control and a symbol of his position in the centre of the cosmos.